I love this recipe for Zucchini Crust Pizza. It's easy to make, full of nutrition and tastes so yummy. Top it with all your favorite pizza toppings and it's a great meal on the go! favorite pizza toppings, cheese, meats, etc. 2. Drain the grated zucchini. 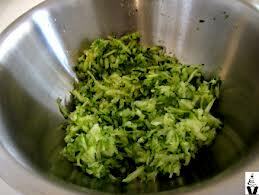 Place the zucchini pulp in mixing bowl with eggs, flour and seasonings. Mix thoroughly. 3. Spread the mix onto a prepared, greased pan and bake for 8 minutes. Another easy clean-up is to bake the crust on a parchment paper lined cookie sheet. 4. Remove from oven. Top with favorite pizza sauce and favorite pizza toppings. 5. Return to oven and bake an additional 15 to 20 minutes at 350 degrees.